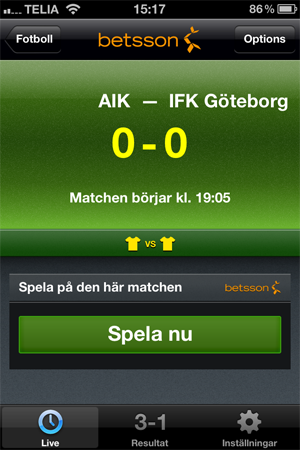 Betsson’s Live Score App makes it hard to place a bet! Betsson has a Live Score app with most of the functionality I need. But they sure are making one big mistake! It is not possible to place a bet from within the app. This lack of functionality makes it real hard for me as a punter to place a bet. I have to either use Betsson’s other app to do it, or use their mobile website. (btw, the mobile website and betting app are from what I can tell the same thing). Image 2. Individual match in the Live Score App. If you want to place a bet on a match, then you click on the “Spela nu” button (“Spela nu” is Swedish for “Play now”). When you click the button the browser is opened and you are redirected to the start page of their mobile website. This is really lousy from a player experience point of view. The best thing Betsson could do would be to integrate the possibility to place a bet within the app, it would make me place a bet. As the app is now I don’t feel it is worth the effort.